Tony Lee Moral is a suspense author who has written three books on Alfred Hitchcock. His new novel Ghost Maven is available from Cactus Moon Publications. In this interview, he explains how you can borrow techniques from Hitchcock’s films to make your fiction suspenseful and exciting. CWN: What suspense techniques did Hitchcock use that are applicable for fiction writers? Hitchcock gave the audience more information than he gave the character, which is a technique I also use in my fiction writing. He said that you can’t expect an audience to have anxieties if they have nothing to be anxious about. For example, if there’s a bomb under the table that’s going to go off in five minutes, and the reader knows but the character in the book doesn’t, that’s five minutes worth of suspense. CWN: How did you use some of these techniques in writing your own novel, Ghost Maven? I similarly gave more information to the reader than to the character. For example, when Alice goes to the Point Pinos lighthouse, the reader knows that something ominous is going to happen, but Alice doesn’t. As a result her trip to the lighthouse is very suspenseful. The suspense in the first third of the book is about what will happen when Alice finds out that Henry is a ghost. I lay clues for the reader so they are always wondering what is going to happen next. CWN: Could you talk about how Hitchcock used setting to advance a plot? Hitchcock famously used settings not merely as background but to advance the story. Some of my favourite examples are the Crop Duster attack on Cary Grant in North by Northwest, the use of screaming ‘Fire!’ to escape a theater in Torn Curtain, and the windmills turning the wrong way in Foreign Correspondent. Maybe the best use of location and plot occurs in North by Northwest when Cary Grant is surrounded by heavies at an auction. What does he do to escape? He starts bidding nonsensically so that he gets arrested. That’s a really clever use of locale to advance your plot and demonstrates the collaboration between Hitchcock and his screenwriter Ernest Lehman. CWN: How did you use settings and description for your plot in Ghost Maven? I thought about how the old town of Monterey and Pacific Grove could evoke the past, as they are among the oldest in California. This fits the theme very well of Alice falling for a ghost who is 100 years old. Small locales like coffee shops and bakeries play an important role in connecting the past with the present and offer clues to the fact that Henry has been living in the town for a very long while. CWN: Could you talk about writing a novel opening that hooks readers right away? As Hitchcock said, start with an earthquake followed by rising tension. I start Ghost Maven with the heroine in deep water and facing her worst fears – fear of drowning. This immediately puts your central character in jeopardy and encapsulates the main theme in the book, which is fear of death and whether there is an afterlife. I would say the opening chapter is the hardest for an author to write, because that is what hooks your reader, not to mention agents and publishers. CWN:What techniques do you use to keep readers interested and turning pages? It goes back to writing suspense, which is an emotional process, so keep your plot suspenseful. I often end each chapter with a cliffhanger so that the reader will want to read just one more chapter. Mystery on the other hand is an intellectual process focused on the question of whodunit. There are mysteries that run throughout the book, some of which are unexplained. As Hitchcock said, you don’t need to answer every question in a mystery story as unanswered questions will leave the viewer or reader wondering what happened and talking about it at the end of the film or book – he called this ‘refrigerator talk’, the moment a couple come back from a movie and reach into the fridge to eat something and discuss the plot. CWN:When writing a suspense novel, do you think it's important to include plot twists and surprise the reader? Absolutely, twists and turns are what keep the readers turning pages. Sometimes Hitchcock gave away the plot twists early rather than save them to the end. The most famous example is in Vertigo, when he revealed two-thirds through the film that Kim Novak’s Judy is also Madeline. The result is doubly suspenseful as the viewer is left wondering what will happen when James Stewart’s character Scottie finds out, leading to the fateful denouement. CWN:Do you have any other advice for aspiring suspense writers? Read books, watch films, and delve deep into your own lives for inspiration. Rereading Ghost Maven makes me realize how incredibly personal it is to me. I drew upon my own childhood fears of drowning, a sense of the afterlife and also my interest and appreciation of nature, especially marine life. 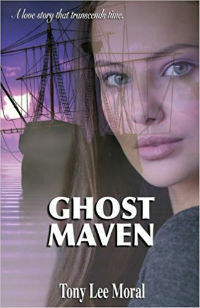 You can learn more about Tony Lee Moral’s writing on his website, GhostMaven.com.